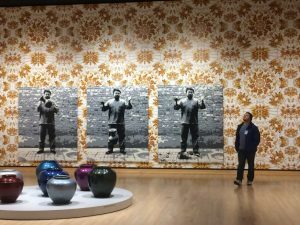 Ai Weiwei is not a neutral figure. His work is intentionally provocative. He has bucked the authority of the Chinese government and the power at the disposal of an authoritarian regime, having suffered physical abuse during a stint in prison and personally witnessed the government-ordered destruction of one of his studios. 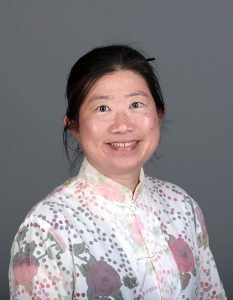 In short, Ai’s international renown is inseparable from his reputation as a political dissident. Having read about the artist, his political activism, and the wide range of media in which he works, I had an ambivalent opinion of Ai and his work. I admired his courage but did not appreciate his angry, intentional, and at times crude provocations. His is a needed voice—I reluctantly acknowledged—but I wondered if I would find beauty in his work. 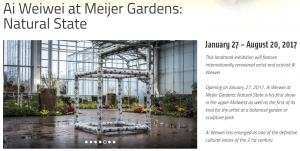 Thus, when I first learned that Ai’s work would be exhibited at Frederick Meijer Gardens and Sculpture Park in Grand Rapids, I was thrilled. 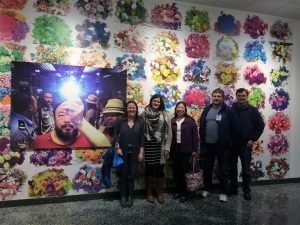 What a treat it would be to see the exhibit with students who are taking my Modern China class this semester! Off we went on a rainy Tuesday evening in February, joined by Professor Steve Smith from the Department of Economics and Business and Mrs. Smith. Seeing his work in person gave me a newfound appreciation of Ai as an artist. His versatility—mastery of both traditional art forms and digital media, as well as many genres in between—is even greater than what I previously read about him. Seeing the actual artworks, and not merely pictures of them, brought the man’s creative gifts to the fore. The visual arts “speak” eloquently where words fail. 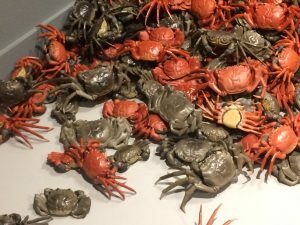 One of my favorite installations at the exhibit was a pile of ceramic river crabs—each one skillfully crafted, inviting the viewer to a feast of sorts. River crabs are a treat in Chinese cuisine. Ai invited his fans in November 2010 to a party featuring river crabs upon learning that the authorities of Shanghai were going to demolish his newly built studio in a village near Shanghai. The destruction of the studio occurred in January 2011. The crabs, long digested by now, were an “eat-and-tell” commentary on the Chinese government’s motto of promoting social “harmony”—héxié—which sounds almost the same as river crabs—héxiè. The ceramic ones, of course, continue to “speak” in protest against the arbitrary powers of the Chinese state wherever they are exhibited. As for Ai, he continues to speak through his art, offering provocative and thought-provoking reflections not only on conditions in his native China but also on issues faced by our global world. One of his upcoming exhibits, entitled “Good Fences Make Good Neighbors,” will open in New York City in October. Ai will build more than 100 fences and installations across several boroughs of the quintessential American metropolis. Is anyone interested in going to New York this fall?